Leo and Tig : A colorful and heartwarming adventure game set in the mystical taiga. Come and meet the characters from the animated series Leo and Tig! 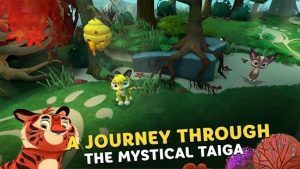 Embark on a new adventure and play as one of your favourite characters from the animated series: Leo the Amur leopard, Tig the playful tiger, Mila the little weasel, Jara the crafty lynx, or Cuba the cheerful boar. Each character has a unique personality and special abilities to help them overcome all kinds of difficulties. Test your memory and reaction time and develop your logical thinking alongside the characters in a series of fun tasks. The game includes five expansive locations where a story of friendship, helping each other and caring for nature unfolds. The game’s plants and animals reflect the magnificence and diversity of Primorsky Territory, and players can interact with all of the living things featured. For every task you complete, you’ll receive cards with exclusive illustrations, sketches and postcards from your favourite cartoon. When I open the app, it gets stuck on a screen with a tiger wearing headphones and it says “It’s more fun with sound”. I have sound on my phone, and tried earplugs too but it won’t go past this screen.